Editor’s Note: Reminder, it’s time to VOTE. Check out our voting guide HERE. Exercise your right! Unless you’ve been living under the proverbial rock, you probably know there’s an election this week? It’s hard not to notice all the political ads on TV, or candidates’ signs all around Champaign-Urbana. Personally, I’ve become obsessed with political yard signs: specifically, the colors they use and their party identification. I wanted to know, do Republicans use mostly red on their signs, while Democrats use mostly blue? 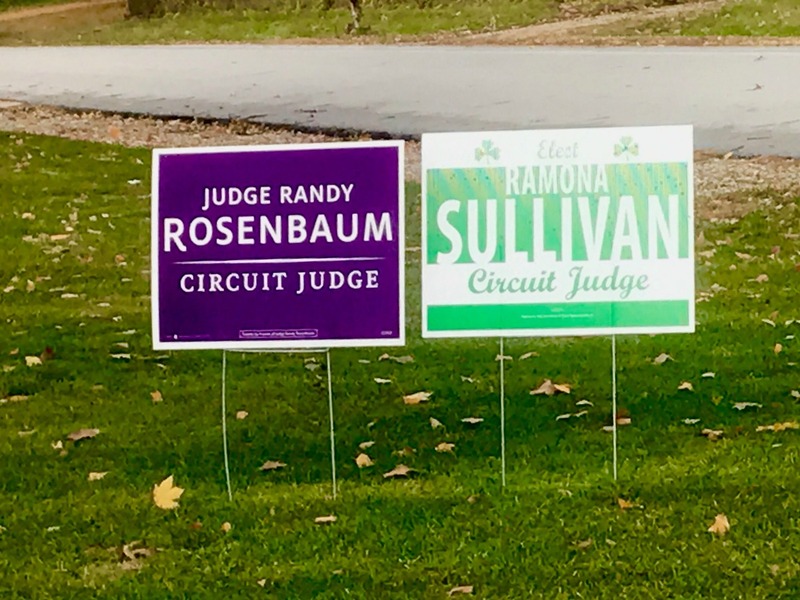 Can you tell which party a candidate belongs to just by looking at their sign? To answer those questions, I started gathering data, and now I have detailed information on more than 30 signs, representing 16 Democrats, 16 Republicans, and one independent. Buckle up, because it’s about to get nerdy! Blue is the most popular sign color, with shades varying from light to very dark. It is more popular among Democrats (78% of all Democratic signs) than Republicans (44% of all Republican signs). However, most Republican signs using blue have it as the dominant color, rather than an accent color. About 45% of all signs use blue as the dominant color, the color taking up the most visual space on the sign. The biggest races, for Illinois governor and U.S. House of Representatives, all have predominantly blue signs, for both Democratic and Republican candidates. Only 6% of local Republicans use red as their dominant sign color. This actually represents just one Republican candidate, Jim McGuire. In contrast, the Democratic signs using red either have a balance between the three flag colors, or they use red only as an accent. Purple is the most popular non-flag color, and it’s equally popular between Democrats and Republicans. Purple might be used to denote bipartisanship, to appeal to both parties, or, in Democrat Mike Ingram’s case, just because he loves Prince. Besides color, how can you tell what party a candidate belongs to when looking at their sign? It turns out that you often can’t tell. Fifty percent of local Democrats display their party affiliation on their signs. However, none of the local Republican candidates do that. This was the most interesting part of my data, and it makes me wonder… why do none of them identify as Republicans on their signs? I can’t answer that with the limited data that I have, unfortunately. If only I’d gotten nerdy about this a few election cycles ago, so I had other data sets to compare! No matter what your political affiliation, or your favorite sign color, make sure to exercise your right to vote on or before November 6. Go to VoteChampaign.org for non-partisan resources and information about Champaign County races. Cynthia McKendall is a mom of two middle school girls who once competed in roller derby, loves to travel, and dabbles in political analysis. She lives with her family in Champaign.